Location of Plainfield in Hendricks County, Indiana. In 1822 a tract of land which included the area now known as Plainfield was obtained by Jeremiah Hadley of Preble County, Ohio. Ten years later he sold it to his son, Elias Hadley. Levi Jessup and Elias Hadley laid out the town in 1839. Plainfield was incorporated as a town in 1839. The town got its name from the early Friends (Quakers) who settled around the area and established several meetinghouses throughout the county, including the important Western Yearly Meeting of Friends in Plainfield. The Friends were "plain" people, and thus the name "Plainfield". The high school continues to honor the Quakers, using the name for the school's mascot. Plainfield has long been associated with the National Road, U.S. Route 40, which goes through town as Main Street. One incident which brought Plainfield national attention occurred in 1842 when former President Martin Van Buren was spilled deliberately from his stagecoach into the thick mud of the highway. The practical joke came as a result of Van Buren's vetoing a bill from Congress to improve the highway, a move which angered Western settlers. When Van Buren came through Plainfield on a swing to shore up his popularity for the 1844 election, a group of perpetrators set up the incident. The elm tree whose roots caused the president's carriage to topple became known as the Van Buren Elm.An elementary school near this site is named Van Buren Elementary School. In the 1980s Plainfield became the headquarters of the Islamic Society of North America. The Hendricks County Bridge Number 316, Plainfield Historic District, and THI and E Interurban Depot-Substation are listed on the National Register of Historic Places. Plainfield is located in southeastern Hendricks County at 39°41′51″N 86°23′5″W﻿ / ﻿39.69750°N 86.38472°W﻿ / 39.69750; -86.38472 (39.697471, -86.384672). It is bordered to the east by Indianapolis in Marion County and to the north by Avon. Interstate 70 runs parallel to US-40 about 3 miles (5 km) to the south, with access from Exits 66 and 68A. According to the 2010 census, Plainfield has a total area of 22.38 square miles (57.96 km2), of which 22.27 square miles (57.68 km2) (or 99.51%) is land and 0.11 square miles (0.28 km2) (or 0.49%) is water. Plainfield is located in the Central Till Plains region of the United States. There are few moderately sized hills, and a mix of deciduous forests and prairie covers much of the area within the town limits. White Lick Creek, a tributary of the White River, flows north to south through the western side of Plainfield. On the eastern side of town, Clark's Creek, a tributary of White Lick Creek, flows towards the south. U.S. Route 40, also known as the Historic National Road and the Cumberland Road, passes through the middle of Plainfield and is the main arterial route running east to west in the town. It leads northeast 14 miles (23 km) to downtown Indianapolis and southwest 57 miles (92 km) to Terre Haute. From north to south, State Road 267 connects Plainfield to the neighboring towns of Avon and Mooresville, and it provides access to Interstate 70, about 3 miles (5 km) south of US-40. Plainfield's historical town center is situated around the intersection of U.S. Route 40 and Center Street, also known as Old State Highway 267. Indianapolis International Airport borders the east side of Plainfield, in Marion County. As of the census of 2010, there were 27,631 people, 9,747 households, and 6,756 families residing in the town. The population density was 1,240.7 inhabitants per square mile (479.0/km2). There were 10,386 housing units at an average density of 466.4 per square mile (180.1/km2). The racial makeup of the town was 85.2% White, 7.9% African American, 0.2% Native American, 3.3% Asian, 1.5% from other races, and 1.8% from two or more races. Hispanic or Latino of any race were 4.0% of the population. The median age in the town was 35.5 years. 24.5% of residents were under the age of 18; 9% were between the ages of 18 and 24; 30.9% were from 25 to 44; 24.3% were from 45 to 64; and 11.3% were 65 years of age or older. The gender makeup of the town was 52.8% male and 47.2% female. "The Shops at Perry Crossing" is a 600,000-square-foot (56,000 m2) open-air retail mall. It opened in October 2005 and was purchased in February 2014 by Poag Shopping Centers, which currently operates the mall. The mall received a $11.1 million renovation and rebranding project to revitalize the shopping center; the project concluded in November 2015. Plainfield boasts 18 hotels, including an Embassy Suites full-service hotel and conference center. The town's proximity to the Indianapolis airport and Interstate 70 have made it an attractive location for hotel space. The Plainfield Correctional Facility (formerly Indiana Youth Center) of the Indiana Department of Correction is in the western part of Plainfield. As of 2012, it held over 1,600 inmates. The Plainfield Community School Corporation is the only public school system in Indiana to have all of its schools receive a 4 star rating for two consecutive years. In 2009, a new High School was constructed. The former High School became the Middle School, and the former middle school building was converted into "Clarks Creek Elementary", an upper elementary school for grades 4-5. However, as of the 2012–2013 school year, the corporation changed this setup to a High School (9-12), Middle School(6-8), and four K-5 elementary schools. Private schools in Plainfield include Plainfield Christian School, which is run by Calvary Bible Wesleyan Church of Plainfield, and Saint Susanna Catholic School, which is run by St. Susanna Catholic Church of Plainfield. The town has a lending library, the Plainfield-Guilford Township Public Library. The Plainfield Recreation and Aquatic Center is located on Plainfield's west side on Vestal Road. The two-story center is 11,300 square feet (1,050 m2) in size. Three basketball courts, an indoor walk/run track, a fitness center and an indoor play area for children are all features of the center. However, the most attractive feature at the Plainfield Recreation Aquatic Center is the 3.1 acre tropical-themed Splash Island Family Waterpark. It includes three waterslides, a play area for all ages and plenty of deck space and grass areas for sunbathing. The park also includes a six-lane competition pool with two 1-meter springboards. Visitors can also float on tubes along a 12-foot wide, 900-foot long lazy-river water attraction. Plainfield's trail system includes over 20 miles (32 km) of pathways. These paths connect the town's several parks and recreational centers. The Vandalia Trail runs almost 5 miles (8 km) through the center of town. It is planned to become part of the National Road Heritage Trail (NRHT), which will eventually stretch 150 miles (240 km) from Terre Haute to Richmond, Indiana, using the former Pennsylvania and Vandalia railroad corridors, and it will closely follow the historic National Road for much of its route. Hummel Park is located next to Center Street and encompasses 205 acres (83 ha). A 300-foot (91 m) wooden bridge spans White Lick Creek and joins the park's east and west sides. The east side offers a variety of sports venues, including basketball and volleyball courts and baseball diamonds, whereas the west side features miles of nature trails, five fishing lakes and an amphitheater. Two shelter houses, one outdoor pavilion and two gazebos are also available for rent. Mark Hampton, notable interior designer, was from Plainfield. Del Harris, basketball coach, was raised in Plainfield. Ron McQueeney, director of photography at Indianapolis Motor Speedway, was raised in Plainfield. Chris Stout, founding director of the Center for Global Initiatives, graduated from Plainfield High School. Forrest Tucker, actor, was born in Plainfield. James Hurst (American football), offensive lineman for the Baltimore Ravens. The town of Avon, Indiana borders Plainfield to the north, with Brownsburg, Indiana just north of Avon. Mooresville, Indiana lies south of town. Indianapolis, along with the international airport and FedEx air hub, border on the west of Plainfield. 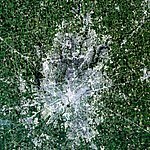 ^ "Geographic Identifiers: 2010 Demographic Profile Data (G001): Plainfield town, Indiana". American Factfinder. U.S. Census Bureau. Retrieved June 20, 2017. ^ Hadley, John Vestal (1914). History of Hendricks County, Indiana: Her People, Industries and Institutions. B.F. Bowen. p. 77. ^ Margaret Moore Post: "Our Town Yesterday." ^ John R. McDowell, The History of Hendricks County. ^ "13 WTHR Indianapolis". 13 WTHR Indianapolis. Retrieved 2019-04-07. ^ Memphis company Poag buys Metropolis mall in Plainfield. indystar.com (2014-02-10). Retrieved on October 11, 2014. ^ "Metropolis mall plans new name, $11M renovation". Indianapolis Star. Retrieved 2015-10-19. ^ "Metropolis announces $11.1 million renovation and name change to The Shops at Perry Crossing :: 05/06/2015 :: The Shops at Perry Crossing, Plainfield, IN". The Shops at Perry Crossing. Archived from the original on 2015-11-16. Retrieved 2015-10-19. ^ "Plainfield Shopping Center to Change Name". www.insideindianabusiness.com. Retrieved 2015-10-19. ^ "2009 Annual Report." Indiana Department of Correction. 49 (49/100). Retrieved on August 27, 2010. ^ "Plainfield Recreation and Aquatic Center facility brochure" Archived 2010-12-22 at the Wayback Machine, Retrieved on January 4, 2013. ^ "Welcome to Splash Island" Archived 2010-12-23 at the Wayback Machine, Retrieved on January 2, 2013. ^ "Plainfield Trails"[permanent dead link], Retrieved on January 2, 2013. ^ "Hendricks County Parks and Recreation" Archived 2013-01-02 at the Wayback Machine, Retrieved on January 2, 2013. ^ "Hummel Park - Indiana's Largest Township Park", Retrieved on January 2, 2013. Wikimedia Commons has media related to Plainfield, Indiana.